Known as the Capital of Cape Cod, Hyannis is a world famous tourist destination that serves as the region’s hub for commerce, fishing, and transportation. 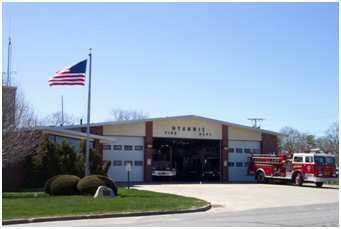 Established in 1896, the Hyannis Fire District covers a diverse area split roughly 60/40 between commercial and residential. The area boasts extensive infrastructure, including a large hospital, extensive harbor, and bustling airport – not to mention the famed Kennedy Compound. All this combined with a population that expands dramatically during the busy Summer months makes Hyannis Fire and Rescue one of the busiest departments on the Cape. It was the desire to better manage the diverse and heavy call volume that originally led Hyannis to make the move to computer aided dispatching. However while the existing CAD had served them well, it couldn’t easily adapt to the department’s changing needs, nor scale up to address periods of peak demand. One key capability Hyannis required was the ability to pinpoint 911 calls from cell phones – something that provides crucial response data at a time when more emergency calls than ever before are made using mobile devices. Hyannis also recognized that having the CAD be able to instantly access the detailed pre-fire plans and other premise information stored in FIREHOUSE® RMS was another powerful tool that could have a direct impact on operations. Now when a call comes in, personnel have one point of access to all sorts of information about the incident location – floor plans, contact info, HAZMAT, burn permits, and much more. Once the call is over, the data collected in the CAD is cross-populated to the RMS, simplifying important post-incident activities such as reporting, payroll, statistical analysis, and billing. Hyannis chose Symposium because of the company’s proven track record of delivering top-notch results for clients of all sizes and requirements. With many Symposium installations throughout the state, it was easy for Hyannis to confirm how well the system works, and how happy other departments are with the service and support Symposium provides. Another more long-term factor had to do with the ability to change and grow. Because Symposium designed the EME with the flexibility to incorporate changing technology and evolving missions, Hyannis will remain at the forefront of emergency response capability for the foreseeable future, without having to change system or provider. Going forward, Hyannis is considering implementing Symposium’s powerful EM Mobile Data to deliver instant real-time access to all relevant incident information directly to the vehicles. This will give front-line personnel even better access to important data, and will result in even more enhancements to speed, safety, and effectiveness.